Kestrels are not common in the Isles of Scilly - which is good news for shrews. But again, not everything here is what it seems This is the Scilly shrew, a lesser white-toothed variety. Unknown on the British mainland, it’s a continental species. So how did it get here? Its habit of hunting for sandhoppers perhaps provides a clue. Ship’s supplies, loaded from a foreign beach sometime in the past, might have contained a stowaway or two. The young are born blind and helpless at first. 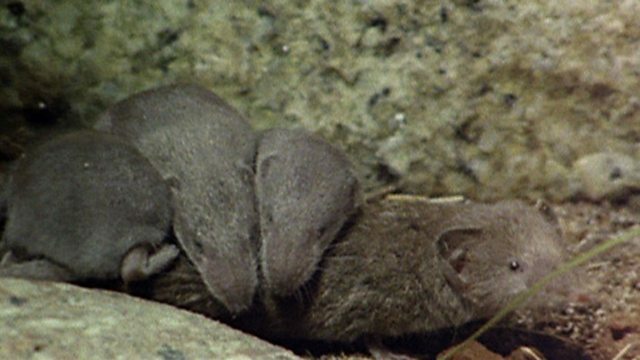 Shrews lead short energetic lives. They must eat their own body weight everyday just to survive. Within ten days they are old enough to leave the nest. And it’s now that some remarkable behaviour is occasionally seen - caravanning. If disturbed, the mother will lead her young away from danger. Nose to tail they are led to safety. Holding tightly to its mother’s fur, one at least makes sure it will not be left behind.